All couples dream of building the perfect house that not only looks magnificent, but also feels like a place worth calling home. A great way to add that touch of magnificence to your dream house, so that you actually look forward to coming back home after a tough day at work, is by getting laminate flooring. Laminate flooring is a multi-layer synthetic flooring product which is fused together through the process of lamination. The laminated floor looks like blocks of wood have been attached together, sometimes even stone. But it’s really the color that makes it look so real. Are you renovating your home for Christmas, or perhaps an upcoming wedding? Then the easiest and fastest way to get your floors done is by getting laminate flooring installed. It won’t take you days and days of work, and as soon as the floor is complete, you can start jogging day and night on it. The blocks used in laminated flooring can easily be cut into different sizes and shapes to ensure that even small corners are easily covered. You can also save money by installing it yourself; it's that simple! Doing it yourself will save you money which can be utilized somewhere else. Not a bad deal. Kids, pets, and high foot traffic can surely ruin the appearance of a floor. Since laminate floors are very strong and have a resin coating, this will not be a problem anymore. Scratches and stains can be easily taken care of, and laminate floors can handle immense pressure. This is because they are floating floors; the blocks are not attached to the subfloor since there is a layer of foam between the subfloor and the lamination, which provides a softer footfall and makes it tremendously durable. If you have a budget to stick to and don’t want to empty your pockets on getting your floor renovated, laminate flooring is the perfect option. If you compare laminate flooring with other flooring options, you will realize that it's quite cheaper. Secondly, since it takes lesser time to install, it also saves up the cost of paying labor for more working days. You can use the saved money on other renovating expenses instead. Everyone is pretty much aware of the fact that sunlight can damage and put stains on the floor. However, you don’t have to worry about that with a laminate floor. The floor is fade resistant, and you can enjoy sunlight entering your home without the fear of the floor getting dull. Apart from that, stains can also be easily removed, so it’s easy to maintain and take care of. With laminate flooring, you have the freedom of choosing the color and style you feel is perfect for your place since it comes in different colors and styles. Laminate flooring is usually seen in wooden styles and colors, but people go for stone colors and unique wood colors that suit their furniture. With the help of the protection layer, laminate flooring is very easy to clean and maintain. You can clean the floor with dry mops and microfiber cloths without using any soap or cleaning fluids. This means all the dust and dirt will be gone within minutes. You can also use a vacuum cleaner to quickly remove all the particles and keep the floor neat and tidy. All the painful stains, which are nearly impossible to remove from other floors, can easily be taken care of on a laminated floor. That also includes stains that don’t come off without proper fluids. Therefore, you can always keep your floor clean and make it look like you got it yesterday. In this flooring method, no natural resources are harmed. You get the appearance of a wooden floor without chopping down a single tree. Apart from that, since there is no space between the blocks to collect dust or other particles, you are protected from dirt related allergies. Save trees, live a healthy life! 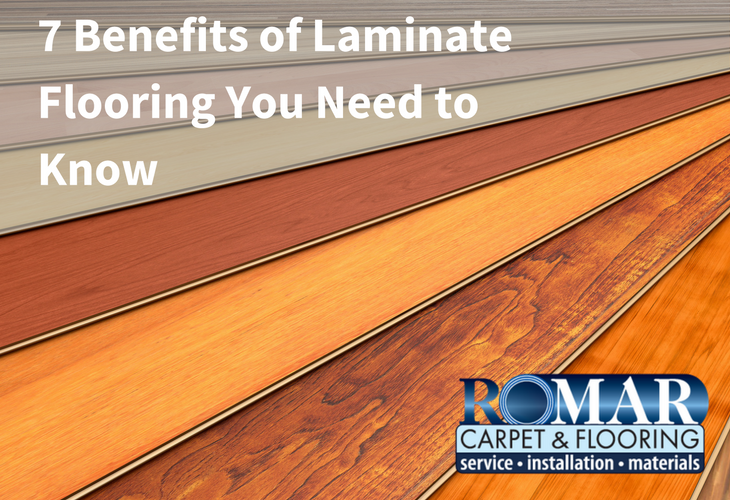 After you get your laminate floor, you may find even more benefits. Did you find these seven benefits of laminate flooring useful? Do you think you can add more? Provide your feedback in the comments below and let me know what you think about laminate flooring.